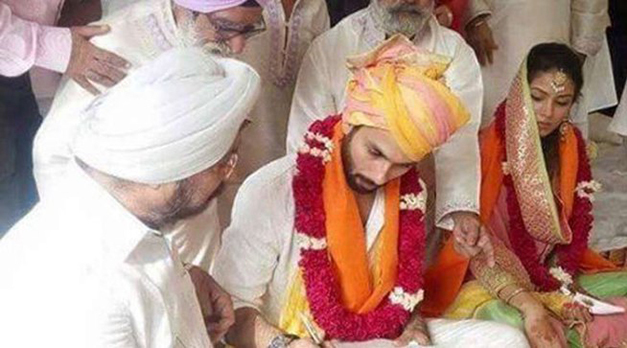 Bollywood weddings have always been star-studded and grand. While these weddings enthrall the fanatics and followers, they like to incorporate the trends and themes of their favorite stars and celebrities in their nuptial ties too. 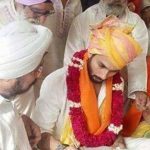 Bollywood weddings are usually big and fat comprised of number of ceremonies and high-points, but Shahid & Mira broke this trend and executed their marriage ceremony in a simple yet stylish way. 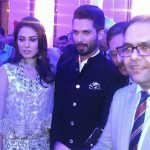 While Bollywood admirers have always tried to keep their wedding grand and extravagant like their favorite luminaries, Shahid-Mira wedding has a lot to inspire too. 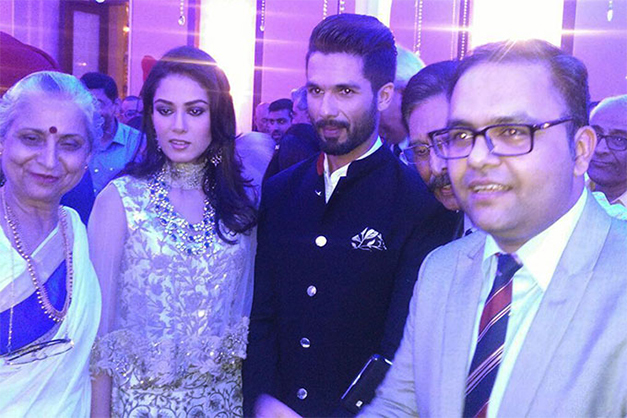 The marriage of the chocolate boy of Bollywood and a simple girl from Delhi wasn’t a display of any extravagance but a fun-packed event. It was a close knit and hush-hush affair, but turned out to be a perfect wedding. While their marriage is a fusion of elegance and simplicity, their two-day affair is the best example of a brilliant use of resources and time. As much as the couple enjoyed taking vows amidst closed ones, it was a memorable occasion for families and friends too. So, why not keep it a low-key affair and enjoy every occasion and ceremony to the fullest like this duo? Unlike other brides, Mira kept her attire sober and simple. She wore pastel colors and sidelined heavy and highly embellished dresses. Overall, she carried herself well and looked comfortable and confident throughout. The point is, you too can look beautiful like Mira without spending heavily on your wedding dresses. Not only would you look decent and one-of-a-kind, but pretty too. Mira broke the stereotype, would you join her in doing so? The pretty wife of the film star has set a trend of simplicity and soberness. She completely ditched the heavily embellished dresses and opted to minimalism, which is beautiful. While the wedding took place at a farmhouse, the flowery décor greatly complimented the venue. The pinwheel decorations and bronze bells added further beauty to the pink, beige, and yellow themes. While the décor was unusual, it looked gorgeous too. 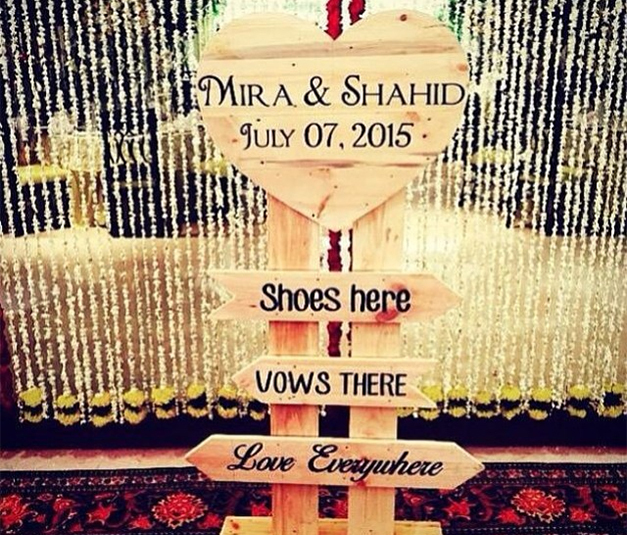 Most importantly, the décor wasn’t exorbitant and that’s the most commendable and significant aspect of their wedding. Every couple frets about budget and affordability. 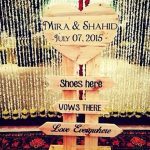 When this newly married couple can nail it with simple and reasonable decoration, you, too, can steal this idea for your big day. Who says a wedding cake should be expensive when taste is all matters. The wedding and reception cakes weren’t expensive but delicious. In short, the couple maintained simplicity in every aspect and ceremony of their wedding. While they avoided booking cakes of expensive bakers, you too can follow their footsteps. 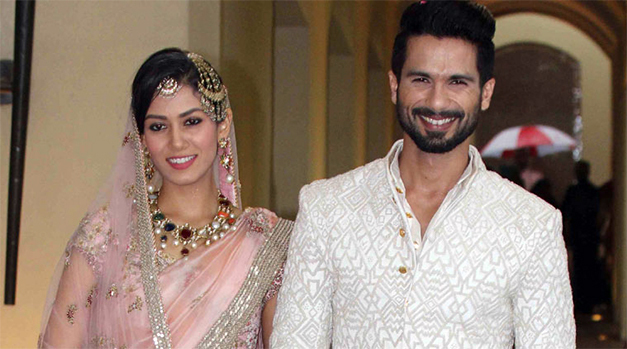 A unique wedding card, yellow rose garlands and elegant jewelry were some more highlights of Shahid-Mira wedding. 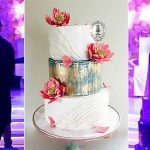 While they brought uniqueness to their wedding with simplicity and soberness, they set new trends for future Indian weddings that are simply beautiful. Glamorous Event Planners also follows latest wedding trends and integrates them brilliantly in your wedding to make your wedding event a hit.